The semi-reunited band played a mini-set of ‘Shiny and Oh So Bright’ tracks and classics. 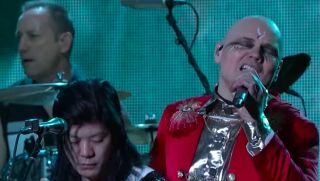 Smashing Pumpkins Share New Song, "Knights of Malta"
Smashing Pumpkins Share Haunted-House-Themed Video for "Silvery Sometimes (Ghosts)"
The band's reunion album, 'Shiny and Oh So Bright, Vol. 1,' is out November 18. Smashing Pumpkins Premiere New Song, "Silvery Sometimes (Ghosts)"
The track is slated to appear on the band's forthcoming reunion album. Smashing Pumpkins Premiere New Song, "Solara"
James Iha, the longtime guitarist for the Smashing Pumpkins and a one-time member of A Perfect Circle, has officially announced a late summer release date for his new solo album, Look to the Sky.